Feb 15 My First Beauty Swap Video on YouTube! 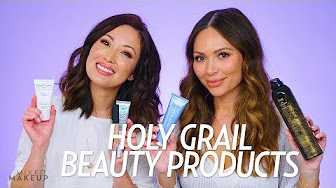 I've been hosting videos on YouTube for almost a decade, so it's a little crazy to think that I have not done a "beauty swap" with another YouTuber in my entire career. If you're unfamiliar with the process (I didn't know until recently), it's exactly as the name implies. Two people with YouTube channels send each other packages with surprise products inside. They each open the box on camera and share the thrill of it with viewers. Now before you brush this type of video off as a way for a beauty blogger to just receive more beauty products, stay with me here. I wasn't sure what I thought of it either. But I have to say, it was a lot of fun. I choose to do the swap with my friend Jenn Marie and decided the goal was to try to send each other products we hadn't tried before. The process of choosing her products was a blast because who doesn't love to surprise a friend? And even more fun was opening the box that she sent me. It felt like Christmas and I'm hooked. I got some great beauty products and got to share my initial reaction to them with you. Watch the video, visit Jenn Marie's YouTube Channel to see what I sent her and then scroll down to shop the products she sent at the bottom of this post. Have a great day!